Pros: Witty, well-pitched and refreshing taste of classical music. Cons: It’s difficult to find any. Price of tickets is a little high given the ethos of the festival. Our Verdict: An eloquently written, superbly performed and directed potted history of Richard Wagner. Straight up, I am no great listener of classical music. I have been to the opera only a handful of times and most of these were amateur performances. I have never intentionally sought to listen to any of Richard Wagner’s music. Though I have unwittingly heard it countless times. It’s probable you have too – The Ride of the Valkyries for one. As a result I felt like quite an impostor hesitantly approaching the press desk in the Royal Opera House. It’s a distinguished venue; frequented by cultural connoisseurs. It can feel a little intimidating; unintentionally, for the most part, as all the staff are extremely friendly and welcoming. 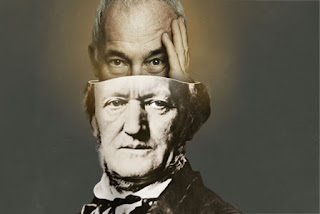 I felt apprehensive, though, because I knew I could not really bring any well -informed, critical analysis to whatever Simon Callow found within Richard Wagner’s head. However, upon reading more about the Deloitte Ignite festival in the vestibule, as I waited for the house doors to open, I discovered I was in fact the festival organiser’s perfect audience type. Deloitte Ignite is an annual festival hosted by the Royal Opera House in partnership with Deloitte UK. In its sixth year, the festival precedes the ROH’s autumn season and aims to connect both organisations with audiences who have previously known little about either of them. 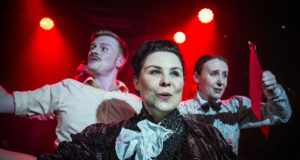 It aims to showcase contemporary creative responses to content linked with the opera house, presumably to illustrate to new audiences the enduring resonance of classical music. This year, curated by Stephen Fry, it celebrates and explores the impact and influence of Richard Wagner and Giuseppe Verdi. Both composers, both born in the same year 200 years ago, but both casting very different shadows across the history of classical music. Inside Wagner’s Head, is a commission, a few years in the making, for this year’s festival. Written and performed by Simon Callow, it delves deep into Wagner’s life and tells his story from beginning to end. It definitely fulfilled the festivals aims in my case. In fact it’s fair to say I’ve discovered Wagner and by extension my interest in classical music has been sparked. Simon Callow is no stranger to unpicking and exploring the lives of great cultural personalities on stage. Last year, he did the same with Charles Dickens, albeit more prolifically as he has recently published a book about his research. 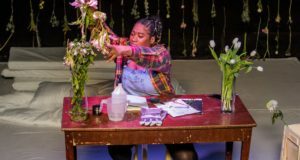 Callow excels at telling the story of an individual on stage; bringing their world to life with effortless characterisation and captivating storytelling. The piece is beautifully written, very witty and at 1 hour 40 minutes, it’s just right. It’s carefully staged with a cornucopia of props amassed on set to suggest the audience, and Callow himself, have literally just stepped into the clutter of Wagner’s mind. Projections and musical interludes compliment the drama perfectly to convey the sheer force and diversity of Wagner’s work; it also brings Wagner’s personality to the fore, warts at all. The obvious and main wart is Wagner’s indelible connection with anti–Semitism, which has sullied his reputation since and sorely divided opinion on his work. This is explored throughout the piece. It suggests that you cannot understand Wagner without understanding German philosophy and politics, both social and sexual in the 19th century. This performance paints him as a bohemian, a lover, a great philosopher, a Kings favourite, a radical anarchist – ready to quite literally set the stage on fire – a great artist; it’s a complex picture of a great composer whose work manifests his changing interpretation of his world and his understanding of art and life. Since returning from this production I have listened to quite a lot of Wagner’s music and I hope to listen to more. This piece is definitely worth seeing, especially if you know nothing or little about classical music. You’ll be on Spotify straight after you leave the auditorium! Tickets for the Deloitte Ignite Festival are a little pricey, however for some shows, including this one, cheaper standing tickets are available. Inside Wagner’s Head runs at the Linbury Studio Theatre at the Royal Opera House until 29th September.